By train: Get off the train at the Central station in Brussels. To get to the de Duve Institute, the thing to do is to take the metro (Gare Centrale) line 1, direction Stockel (do not take line 5), and get off at the station called "Alma". Alma is right on the Brussels Campus of the UCLouvain, where the institute is located as well. Follow the signs "Centre Faculté" and then follow the signs ICP 74-75. It is a 5-min walk from the metro station to the institute, which occupies the buildings 74 and 75 at the Avenue Hippocrate. By car: Coming from either North or South of Brussels, take the east side of the Ring around Brussels and leave the Ring at the exit no 2 "Kraainem/Wezembeek Oppem". From there you follow the road signs to the hospital "H-UCL St-Luc" for about 2 km. You pass the Carrefour supermarket and the Quick hamburger restaurant. Right after the Quick, turn to your right and go straight ahead to enter the campus area behind the sports facilities. Once on the campus you follow the road signs "Parking Faculté", the Institute is situated at the very east side of the Campus opposite the sports facilities. Park your car in the parking lot indicated with the sign "Fournisseurs ICP". To open the barrier at the entrance of this parking, you announce yourself via the intercom or use the access code combination you should have received from your contact person. The institute is now ahead of you. By plane: Once at the Brussels airport it is best to take a taxi from the airport to the institute. It is located at the North-East rim of Brussels at approximately 5 km from the airport and it takes about 10 min by taxi (or more during rush hours). 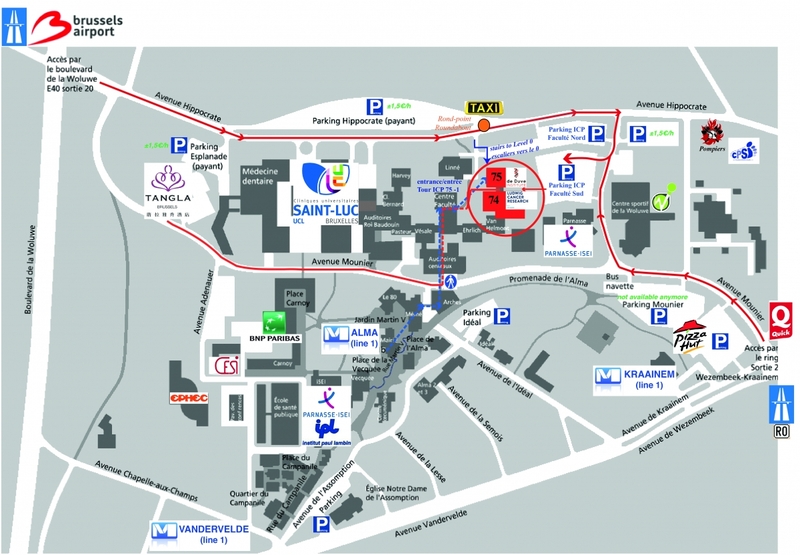 It will cost you around 20 Euros to reach the Brussels-UCLouvain campus in Woluwe. Tell the cab driver that the de Duve Institute is the building next to the university hospital "UCL St- LUC" at the level of the roundabout and let him stop at the bus stop. The Institute occupies the buildings 74 and 75 on the Avenue Hippocrate. The former name "ICP" is still indicated on the building.